THE FABRIC FAVORED BY THE OUTBACK DROVERS HAD ITS ORIGINS ON SYDNEY'S DOCKS IN THE EARLY 1800'S. AN ENTERPRISING SCOT BY THE NAME OF ANDREW LEROY HIT ON THE IDEA OF TURNING SECOND-HAND SAILS, SOAKED IN LINSEED OIL, INTO WATERPROOF CAPES AND THEN SELLING THEM BACK TO THE SAILORS. HERE WAS A FABRIC THAT WOULD REPEL THE STRONGEST GALE AND WAS DESIGNED TO LAST. WHEN STEAM REPLACED SAIL, MANY OF THE SAILORS SWAPPED A ROLLING DECK FOR A GALLOPING HORSE - DROVING ACROSS THE VAST OUTBACK. THEIR OILSKIN DROVERS WERE JUST AS HANDY THERE. OVER THE YEARS, IMPROVEMENTS WERE MADE. 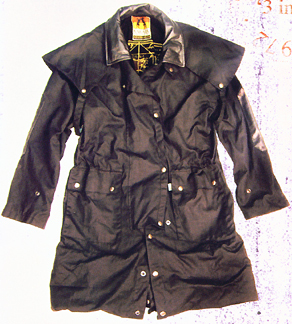 COATS TREATED IN LINSEED OIL TENDED TO CRACK OR ROT. NEW OIL AND WAX PROCESSES WERE DEVELOPED WHICH WERE JUST AS WATERPROOF AND WOULD LAST FOREVER - WELL, ALMOST. KAKADU TRADERS HAS GOT THE PROCESS RIGHT. ONLY USING THE FINEST FABRIC - LONG FIBERED COTTON, TIGHTLY WOVEN AND CONSTRUCTED TO LAST. 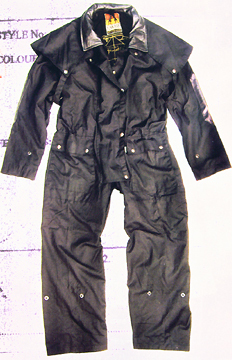 THESE GARMENTS HAVE NATURAL, IN-BUILT CLIMATE CONTROL. THE PROTECTIVE COATING IS SPECIALLY PREPARED TO PROVIDE AN INSULATING BARRIER THAT BREATHES BETWEEN THE WEARER AND THE ELEMENTS. AT FIRST, THE WARMTH IS HELD INSIDE WHICH MELTS THE MICROWAX™ AND LETS EXCESS HEAT ESCAPE. THIS REDUCES THE INTERNAL HEAT WHICH ALLOWS THE MICROWAX™ TO SET AGAIN - RESTORING THE INTEGRITY OF THE GARMENT. KAKADU GARMENTS ARE BUILT FOR COMFORT, KEEPING THE WEARER WARM AND DRY IN ALL WEATHERS. Personally, we like the ability to snap this coat higher when needed and lower it while riding in the rain. You can choose to snap it around your legs, or to wear around your body, more like a trench coat, when standing around. The Drover Duster is being phased out at this time. Iron Bark & Work Horse dusters seem to be taking all the sales that are not the 3-in-1 duster! Kakadu has a more economy model now. Corduroy collar and Self elbow patches instead of the leather. 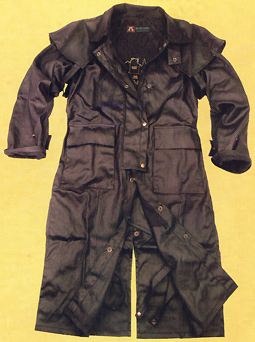 It has all the features you love about these oilskin dusters. Double Storm Placket front and collar. Ability to button in your liner. Not a cheap replica. This is a really good imported Cowboy Duster at a real good price. (We know "look alike" Aussie dusters can be found at $59.99 to $79.99. After examining that quality, Cultured Cowboy decided not to carry anything made so cheap. Without a quality thread count, the oilskin bleeds onto everything. Microwax on Kakadu cotton does not create that problem. ) Your coat should not cause more problems than it solves! Enjoy. 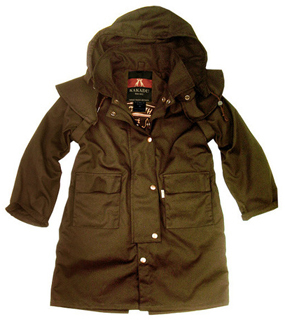 Whether your child Finds mystic adventures through his own yard, or simply needs a good coat for weather, the kids drover coat has all the features you love about these oilskin dusters. This child's duster is tough enough to take "almost" whatever your child might find. Made with the same fabric and legendary MicroWax as adult Kakadu dusters. Built in hood with drawsrting. Storm cape. wide front storm placket. Lower flap pockets. Cotton lined with australian map print. Cultured Cowboy also has Outback Trading and Schaefer Dusters , and Lakin McKey Brands.